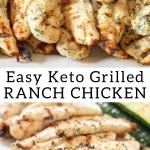 We love this Ranch Chicken all year long. 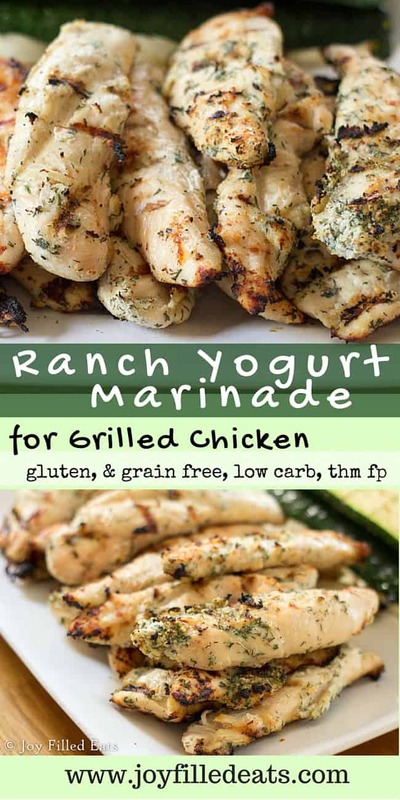 My Ranch Yogurt Marinade is one of our favorite marinades for grilled chicken. It has so much flavor and only 5 ingredients. 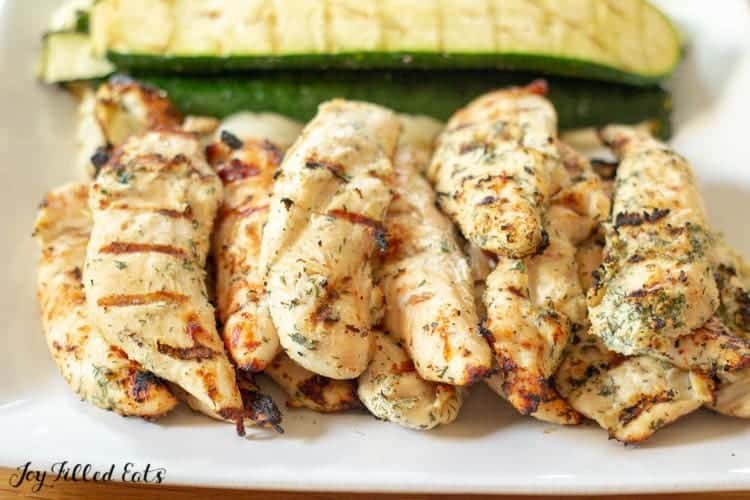 I buy fresh chicken tenders and freeze them in a gallon Ziploc bag with this marinade. When we are ready to have them for dinner I defrost and grill. They are moist, tender, and flavorful. Trying to feed my family of 7 without breaking the bank means that I buy staples in bulk when they go on sale. Whenever I find chicken tenderloins for a good price I buy at least 3 or 4 packs. 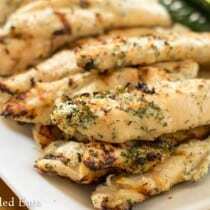 Chicken tenderloins are the perfect portion size for small children. What is the difference between a chicken breast and a chicken tenderloin? The tenderloin isn’t a big chicken breast cut into pieces (even though you can do that in a pinch). It is the smaller piece that lies behind the breast. It really is more tender and is harder to overcook than an entire large boneless skinless chicken breast. 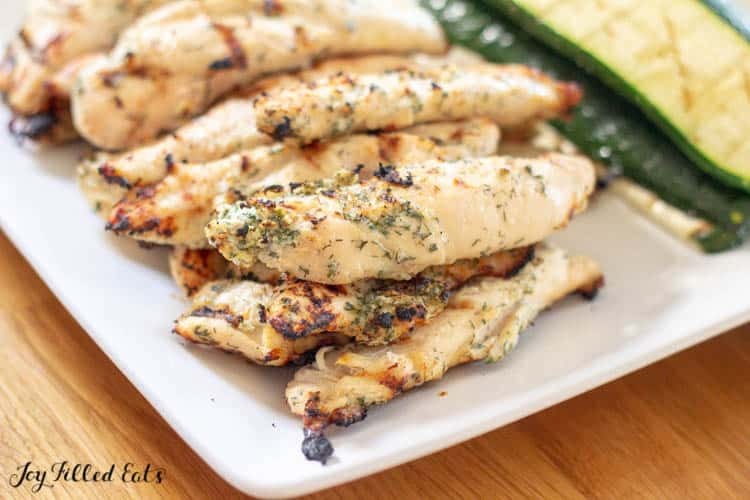 The tenderloins tend to be a little more expensive than chicken breasts but you save on time because they don’t require you to cut off fat or pound thinner to make them cook evenly. 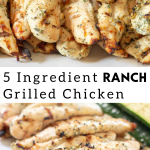 Making ranch chicken is very easy and you do not need bottled ranch dressing. 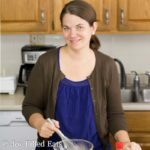 I prefer to use a blend of herbs and spices to make a homemade ranch flavor without all the additives and soybean oil found in most bottled dressings. 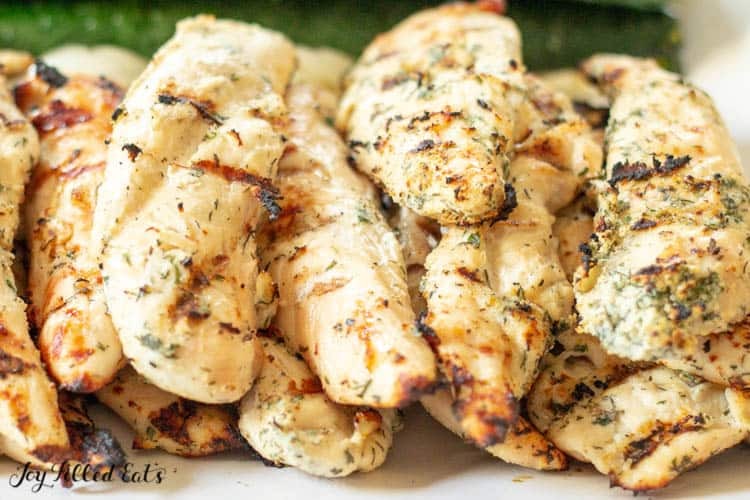 Simply combine yogurt with garlic, onion, dill, parsley, and salt and you have the flavors of ranch dressing for your grilled ranch chicken! I love having a few easy meals in the freezer for nights I don’t feel like cooking. And on days I’ve spent hours in the kitchen developing a new recipe I’m generally tired of cooking when dinner rolls around. My freezer staples are cooked taco meat, cooked meatballs, and raw chicken tenders frozen in a marinade. I can get any of those from freezer to table in 30 minutes. I also use chicken tenders in my Tuscan Chicken Casserole, Five Minute Garlic Parmesan Chicken Tenders, Stuffed Chicken with Asparagus & Bacon, and Bacon Wrapped Chicken Tenders with Ranch Dip. Mix all ingredients in a bowl or gallon size ziploc bag. Add 2.5 lbs of chicken tenders. 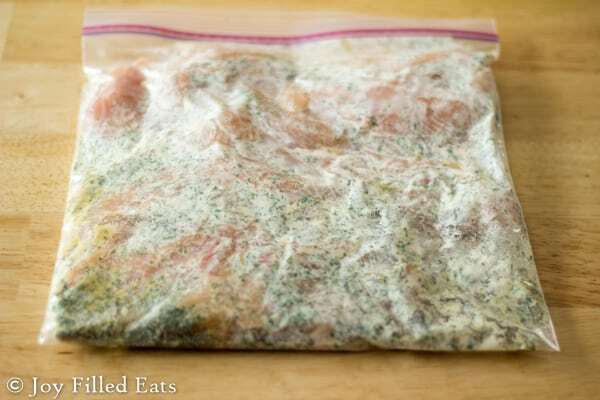 Marinade in the refrigerator for at least 4 hours before grilling. This is a THICK marinade. Don't worry. Just coat the chicken with it and let the flavors meld! You can also freeze the chicken in this marinade. Just thaw before grilling. Originally published May 20, 2016. Updated and Republished on April 23, 2019. Yogurt is the best secret to this recipe...my whole family loved the creaminess. 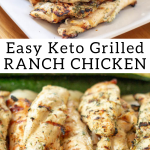 Can this be baked instead of grilling? If so how long would you recommend to bake? Yes. If you are using tenders I would bake for 15 minutes at 400 and then check them every 5 min. They cook quickly. Mine was also very thick and holy moly was the flavour strong!!! I added some milk to thin it out a bit and to tone down the overpowering garlic flavour. Are the measurements correct? A tablespoon of garlic and onion powder? Also for the dill and parsley, you don't specify fresh or dried. This isn't meant to be tasted on its own. The measurements are correct. This covers a lot of chicken tenders. I think my 2.5 lb package had about twenty. It is thick. I just toss the chicken in it but you could brush it on. I used dried herbs. You could use fresh if you have them. is this plain greek yogurt? Not a dumb question. Yes, I use 0% plain Greek yogurt. As long as all the chicken gets coated it will be flavorful. Just toss it until it's coated evenly.